These coupons are valid at all major retailers including Target through February 2, 2019! Plus, look out for the packages with 20% more free! You have plenty of time to use both coupons but they are available to print for a limited time only, so print now! Final Cost: $1.49… HOT PRICE! 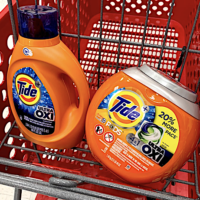 You’ll be happy to know that Tide is consumer’s #1 trusted laundry brand, according to a Readers’ Digest survey. It keeps getting better with Tide PODS 2.0 having been upgraded with better stain and odor removal power. Their new 4-in-1 technology acts as a detergent, stain remover, color protector, and built-in pre-treaters combined. Saving time and money doing laundry is what it’s all about!